We are kicking off the summer in style and a swirl of colorful inspiration! This week I’m joining 36 amazingly talented friends in the Summer Colors Blog Tour hosted by Jennifer from Town and Country Living. If you are visiting from Shabby Fufu then let me extend a very special welcome! 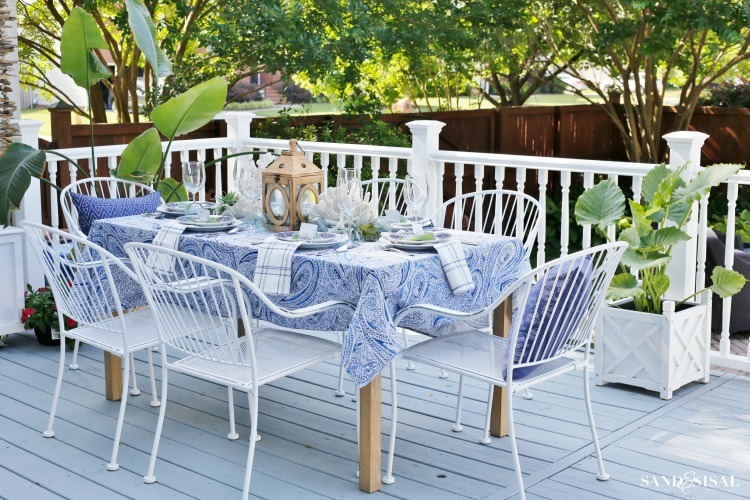 It will be no surprise that my love for blue and white this year is still going strong and I’ve extended the sea inspired palette to the deck also. 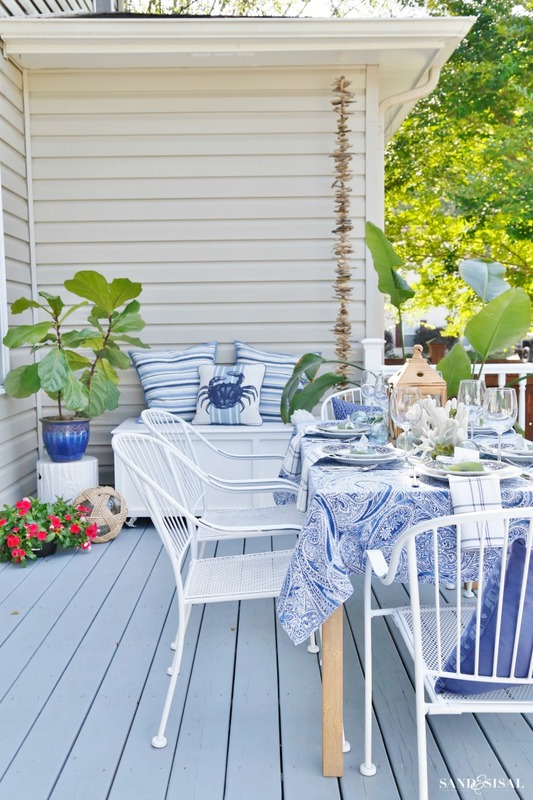 Come see how to create a coastal outdoor dining space even if you live miles from the beach. Coastal colors can range from stormy grays and and silvers to clear aqua and bright turquoise or classic blue and white. The beauty of coastal colors is that they have such variety. I had previously decorated our deck with shades of seaglass, aqua and lime. You can read about our total deck makeover HERE and see the awful before pics. Shortly after we finished the makeover a huge storm can through and took that table and umbrella and threw them up and over the fence into the yard, destroying them completely. Here is a photo of our deck before the tropical storm. A new table and color palette was in order obviously. I’ve listed the table we bought at the bottom of the post. 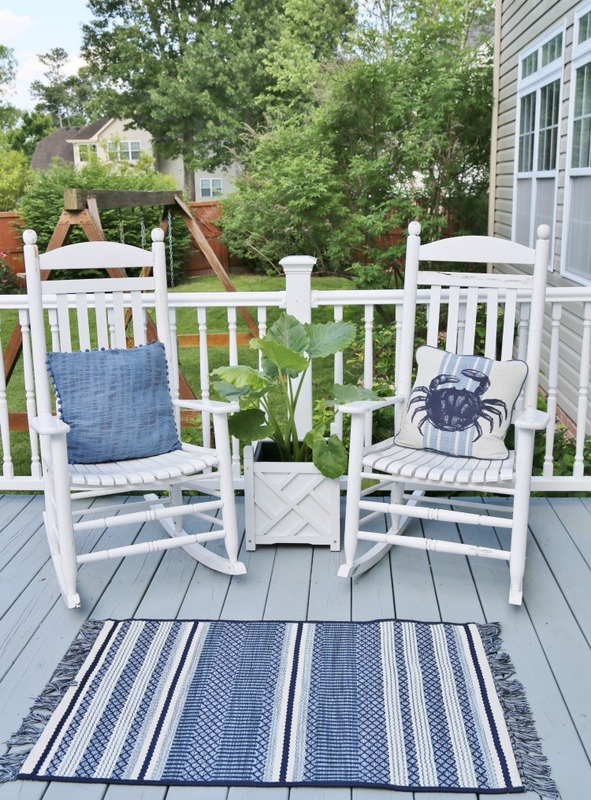 This summer I decided to choose a classic combination of deep navy, cobalt, colonial blue, crisp white, weathered wood tones, and pleanty of lush greenery. The chairs received a fresh coat of bright white paint instead of the previous stark black iron. 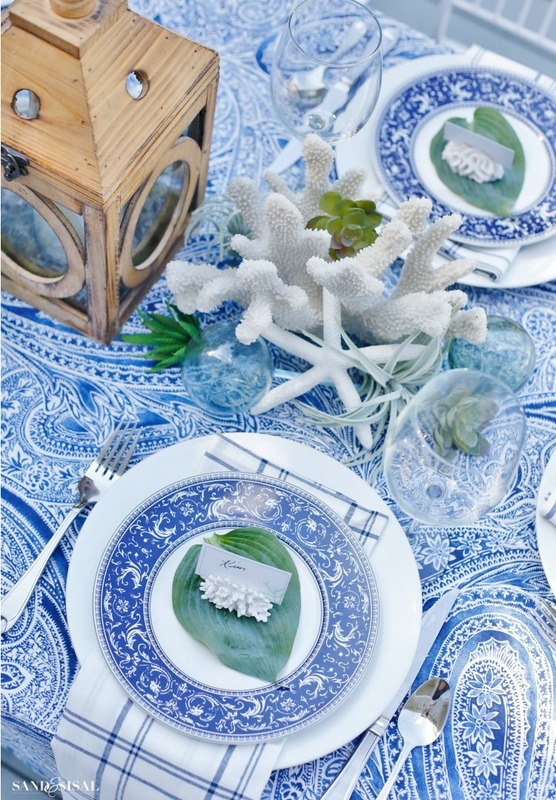 The easiest way to set the coastal color palette for your table setting is by using a colorful, patterned tablecloth. My mother has always done a large amount of entertaining outdoors. She has compiled quite the collection of tablecloths but what she also uses are twin bedspreads and quilts! She picks up the most beautiful quilts on clearance to use specifically as tablecloths. Isn’t it a brilliant idea? This Ralph Lauren blue and white paisley tablecloth was a fab find from HomeGoods. 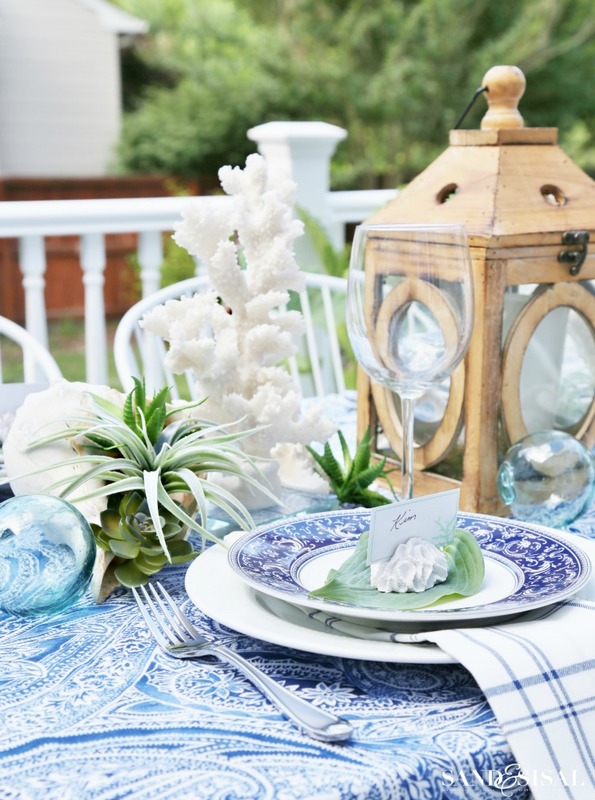 Shop your home for any coastal table decor items. I strongly believe in shopping your home first before going out to buy things. For coastal centerpiece I grabbed items from each room in our house. I used faux coral, sea shells found along the beach during last year’s family vacation, glass floats, starfish, a lantern and faux succulents and airplants. Centerpieces that don’t obstruct the view of the people across from you help create a relaxed environment and invite conversation. 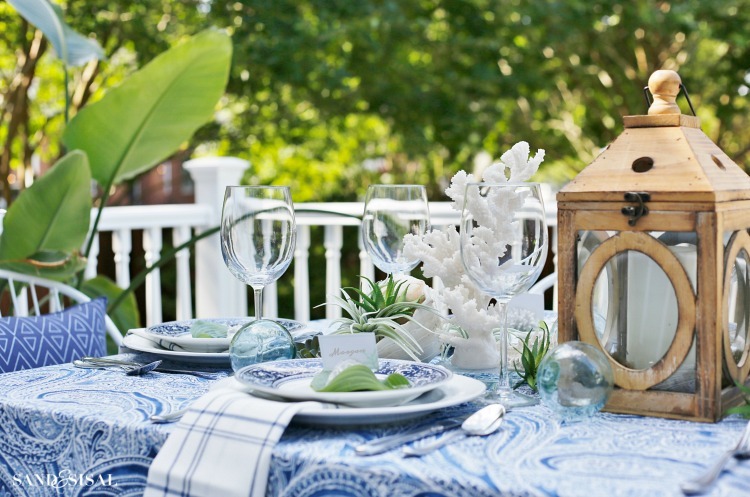 Try to distribute the coastal decor items throughout the table. A center weathered wood lantern with candle will cast soft illumination and warm ambiance. Mixing patterns is easy when you stick to a strict color scheme and choose a large, medium and small pattern. On our patio I combined paisley, plaid, florals, stripes, solids and graphic prints. 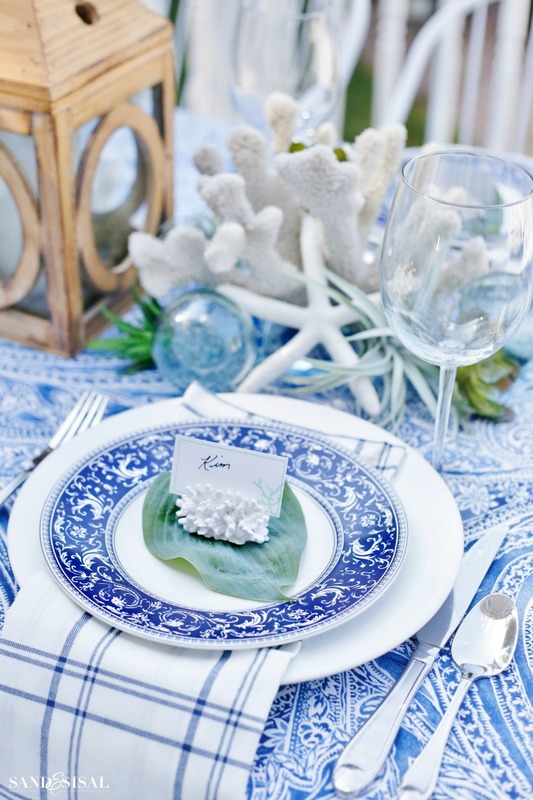 For the place setting I used our everyday white plates, layered with beautiful blue floral rimmed salad plates, and blue and white plaid napkins from the Target dollar bins. The plates were personalized with adorable coral place card holders set upon hosta leaves clipped from the garden. 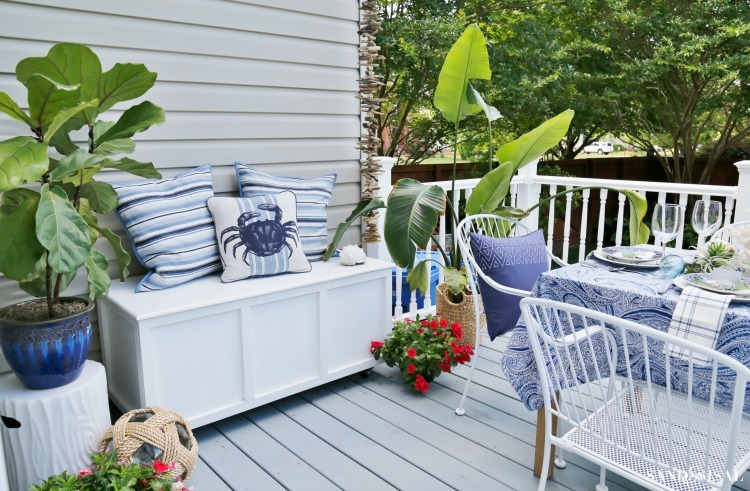 Tropical greenery and flowers can instantly transform any deck or patio into a lush coastal oasis. A few of my favorite patio plants that thrive in the humidity and warm temps are fiddle leaf figs, majesty palms, alocasia ‘California’, bird of paradise and banana trees. Don’t forget to add in some potted annuals for a punch of bright color. 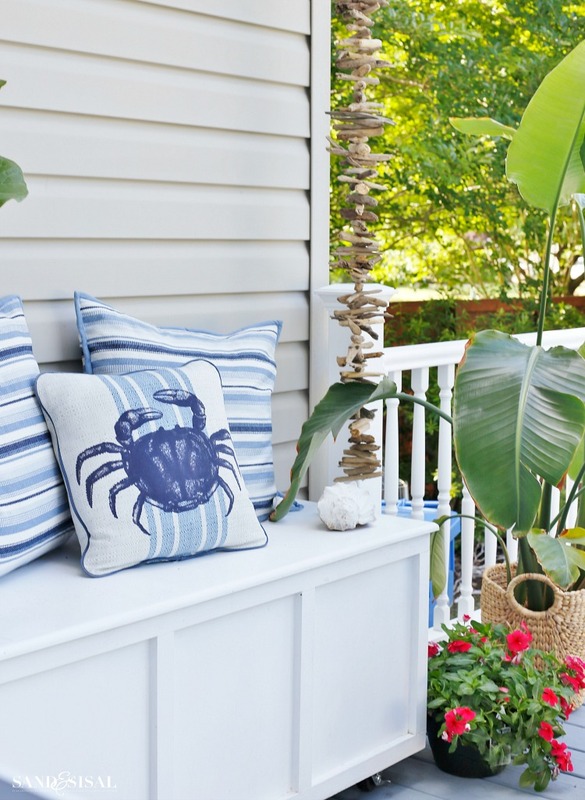 Add in extra seating with fun coastal pillows like this DIY Outdoor Storage Bench. It is still looking amazing after 5 years sitting in the elements! Be sure to check out that tutorial. I designed it so you could make it out of one sheet of plywood. It also holds a bunch of my outdoor throw pillows. Here’s a little view across the deck when guests can relax on “island time”. 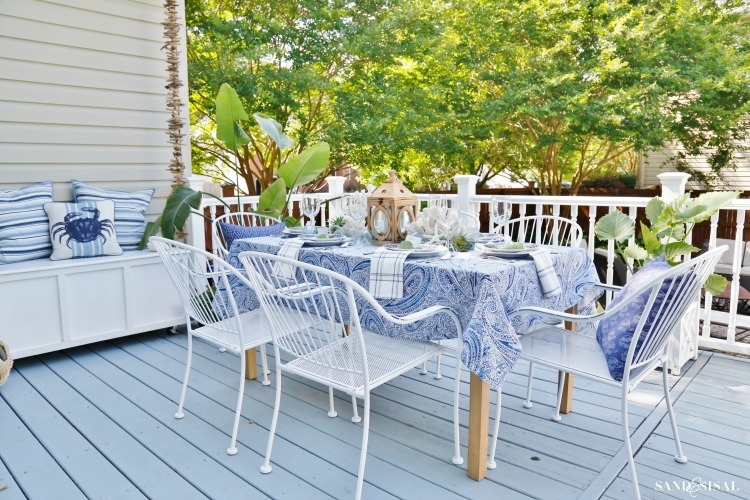 I hope you enjoyed my deck tour and collected some tips on how to create a coastal outdoor dining space for your home! Next up on the Summer Colors Blog Tour is Ann from On Sutton Place! Some affiliate links are provided for your shopping conveniece. 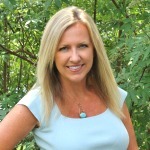 This is just beautiful Kim and I’m such a believer in shopping your own home first! Thank you Janet! It’s always amazing when you start digging through the closets you discover goodies that you forgot you had! Kim, this is such a pretty outdoor area to entertain. I love the blue deck floor. That’s a great idea. I love seeing your deck and table all dressed for a special occasion and for the seasons. Always such a treat! 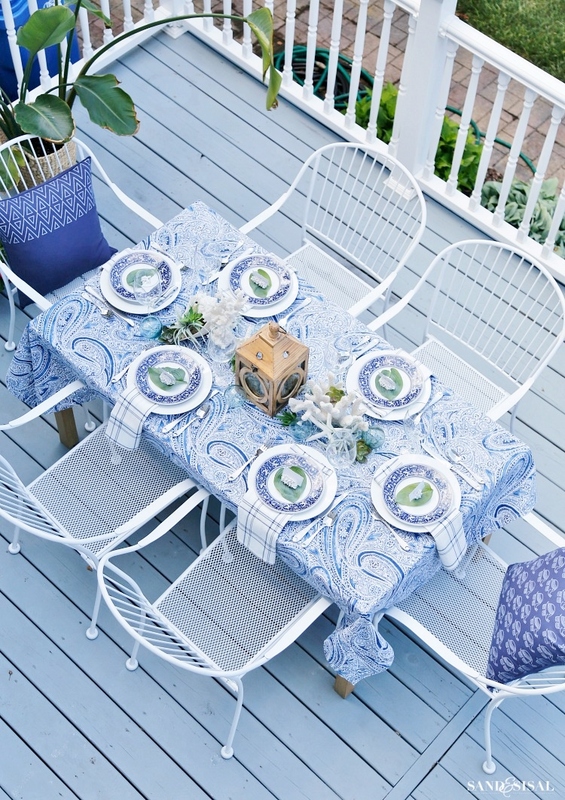 I have seen many blue ceilings on porches that I love, but also placing that gorgeous blue on the deck is so, so pretty! Have a most wonderful Holiday and hope that the weather is cooperating!! I love this! What a beautiful place to spend time with your family. Also, I think your deck floor with the white railing is perfection. Hope you have a great summer Kim! Thank you so much Ann! I love the white vinyl railings too… so easy to clean! One can never have enough blue! I love the way you mixed all the shades. Just beautiful! Ha! That’s for sure! Thanks so much Shelley! Kim, your coastal blues are stunning!! Such a calming and upbeat color and just perfect for summer. Love the paisley tablecloth!! You know I’m feeling you on this blue and white porch thing! 😀 I LOVE it all, Kim! kim, this tablescape takes my breath away. it is just gorgeous! Thank you Laura! I think it is one of my favorites yet! 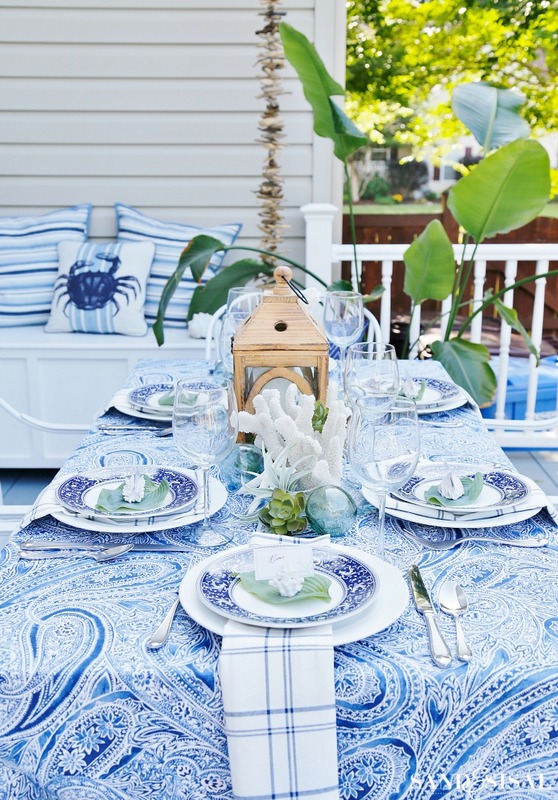 Kim, you always do tablescapes and coastal style beautifully! Love the mermaid sign and all the beautiful blues. Thanks so much for being on today’s tour! Thank you Jennifer! And thank you for putting together this summer tour! Wow! Love all the beautiful blue decor. Your tablecloth is to die for, and I absolutely love it! 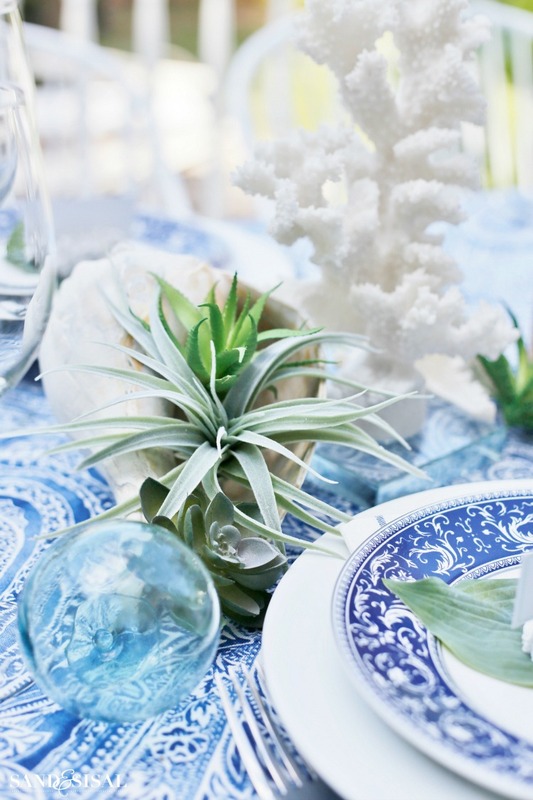 Everything is beautifully coordinated, and your table styling is fabulous! Thank you Janine! The tablecloth was such a great find at HomeGoods, I grabbed it right up! So nice being on this summer tour with you! What did you use to hang the mermaid on the siding? 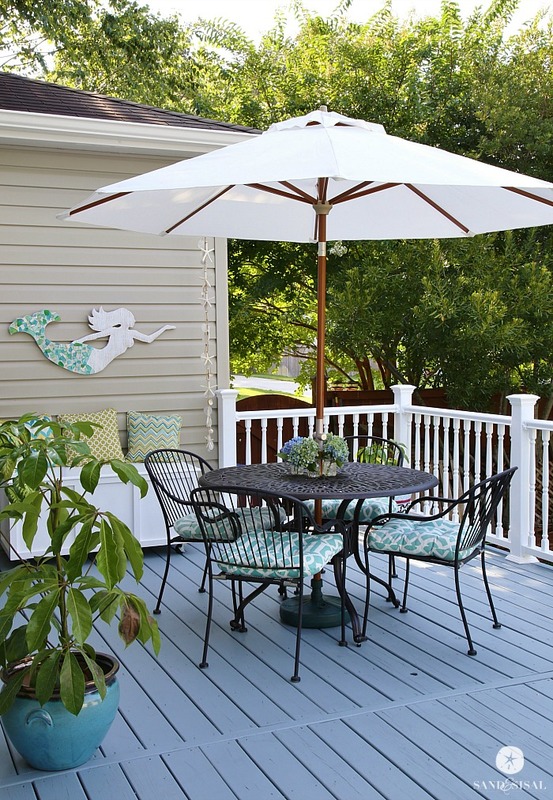 Hey, Kim, I just love your deck space and table! Wow, it’s all gorgeous, you do such a great job with decorating in the coastal look and your table shoes it to perfection. What a fun tour! I didn’t go all out with mine, but kept it simple, but yours is amazing! Oh thank you sweet Rhoda! It was a great excuse to get my deck clean and pulled together! We are enjoying it! Hi Kim, you have created such a lovely outdoor space. I love coastal decor, and your home is perfection! I’m so happy to be on this tour with you. Everything is so beautiful, I love the blue’s! I remember when everything got blown away, so crazy! Now you can enjoy and relax your gorgeous outdoor space! Thank you so much Kristin! We need to catch up some time soon! This is gorgeous! What a beautiful place to sit and enjoy meals together. I love that you shopped your own home. It’s such a great way to switch things up without spending money, love it! Thank you Amanda! It’s amazing what you can find in your own home when you start searching and get creative! Have a lovely week! Beautiful, restful deck! Where did you find the rug in front of rocking chairs?